The Sherwood Forest Visitor Centre has been made possible thanks to a consortium led by the Royal Society for the Protection of Birds (RSPB), in partnership with Nottinghamshire County Council, which currently manages the site, and has invested £4 million. As well as the council and the RSPB, the consortium also includes Continuum Attractions, The Sherwood Forest Trust, the Woodland Trust and Thoresby Estates, who own the land. The project was procured through Scape Venture , which helped to drive the collaborative process from day one. The new centre will be based in Forest Corner, just outside the village of Edwinstowe. It will include a shop and café, with a terrace and amphitheatre outside. Future plans feature the addition of a brand new play area. This centre has been supported by a number of other organisations, including the D2N2 Local Enterprise Partnership, which has pledged £500,000 towards the cost of the new centre. They’re joined by the Garfield Weston Foundation, which has invested £200,000 and the Supporting Local Communities fund, which has granted £40,000 to the project. 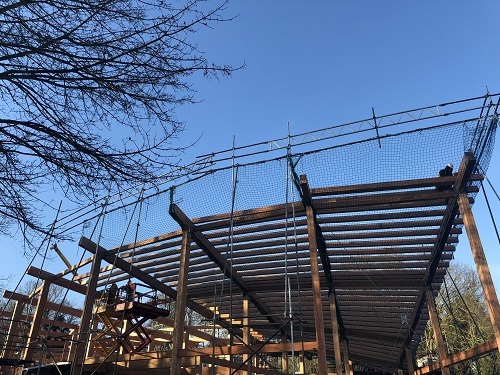 The complex project involves working in a site of special scientific interest and a special area of conservation, the highest protected status in the UK with the largest collection of ancient Oak trees in Europe, Robert Woodhead Limited are building the new and exciting gateway into Sherwood Forest.